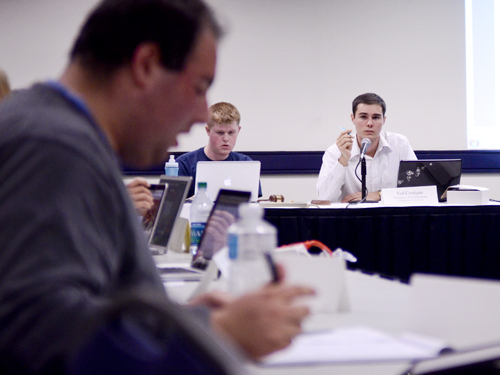 Student Association Senate committees are working on several new campus initiatives, including creating a University-wide calendar, digitizing laundry services and training for student groups on expanding their revenue base. Chair of the SA Student Life Committee Josh Goldstein, U-CCAS, said that committee is exploring several ideas this fall, such as adding vending machines to Gelman and possibly incorporating emergency alerts, like the blue-light system, inside residence halls. Sen. Cory Grever, U-Large, in an interview after the meeting, said he hopes to present a bill for an electronic monitoring system for the University’s laundry rooms at the Senate’s next meeting Nov. 7. The LaundryView system enables students to see how many washers and dryers are in use, in addition to emailing and text messaging alerts when their load is done. Grever said he worked with the company this summer to determine if the system is compatible with the University’s laundry services. The service differs from the system launched by American University in 2005, but will include many of the same functions. He hopes the system will launch sometime next semester. The company has not supplied a price quote yet, but Grever said because the system is based online, the costs would not be substantial. The Student Life Committee is also looking at creating a grocery service in which students could purchase basic food items from Sodexo and pay with their J Street dollars. The Finance Committee, led by Sen. John Bennett, U-At Large, just approved the first round of co-sponsorships, totaling $3,500, and is looking to expand the committee’s relationship with student groups this year. “What is the new role for the finance committee now that the majority of work has been done?” Bennett said to the Senate, explaining that the new allocations system has freed up the committee’s time for the rest of the year.